The merit of supporting Christian monastics? Some christian sects like the orthodox sects your talking about here, the catholics and even the novus ordo sect all have monastic traditions. My question is, how does the merit created by supporting and sponsoring these monastic christian contemplatives compare to sponsoring buddhist monastics? I had posed this question in another thread. Supporting celibate Buddhist monks and nuns create so much merit, how does it compare to supporting christian monastics? I know there are vows that talk about giving to those who's practice is contemplation vs. giving to those who's practice is recitation. This may be relevant here..
Is it safe to say that giving to monastics of other traditions brings less merit? Re: The merit of supporting Christian monastics? Yes. This is definite as they are not included in "The Triple Gems". The reason why offering to buddhist monastics carries vast merit is because, as text explained, they are the supreme merit field. Of course, sentient beings are included in the "merit field of compassion". It is explained in the test that goes along the reasoning that giving to beings is need carries more merit than beings that are not in need etc...I think there is a specific text that explains this point. 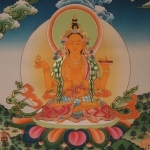 The Diamond Sutra teaches that giving and other virtues should be practiced without attachment to the concept of the three spheres (self, others and the acts). It didn't say that one should not be attached to practicing virtues. If it hurts or worries you to give to Christians, then you need to give to Christians. Giving doesn't mean money, mind you. Assess what is needed and give that, but still give. There should be no separation between you and the needs of sentient beings, ideologically-based or otherwise. Being aware of your aversion as illusory, overcome it. We only have so much time and energy. Dharma practitioners need to focus their generosity on Dharma practitioners when they have the choice. Do they, or can they make up their own minds based on what is causing them problems? As much as we have to support one another, one's personal practice is paramount, because no one can confer realization on another person through force of will. Confronting aversion and neutralizing it is much more beneficial, I would say, than engaging in generosity that makes you feel good because it's comfortable/aligns with your pre-existing values. When you open up, you can accomplish anything. Already, you've placed a needless limit on yourself and others. Caring for the practitioners of other faiths can and will improve their attitude toward the Dharma, if properly motivated. Giving to Dharma practitioners generates more merit, therefore it's in Dharma practitioners' best interests to help other Dharma practitioners if they have a choice. You don't need to spend time and energy helping christians to reduce aversion to them. Sure, but it is much more beneficial for all sentient beings to help Dharma practitioners. People will only come to the Dharma if they have the karma. And even if they do, will they stay? And even if they do, what is their capacity to benefit others? Etc etc. This is my best offering to you; if it's unhelpful or insufficient, I'm sorry. Please forgive me. I can only guess at what actually reduced my aversion, and I didn't notice it subside until I engaged with it directly. My parents are very Christian, and I had to give many offerings of body/speech/mind to improve our relationship (& my overall view of Christians) to the point where they no longer disturb my mind. Moreover, I couldn't achieve this through solitary meditation/logical reflection alone -- karma yoga seemed to be necessary. For myself, it had a deeply humanizing effect: rather than philosophizing about the kindness of my mother sentient beings, I began to feel it tangibly (as well as feeling more at home in my own body). The result is that I can engage with Christians on a productive level while avoiding hindrances to my practice. I certainly don't engage more than necessary, but it's hard for me to ignore what this has done for my life. Because much of the world is dominated by the Abrahamic faiths, and because I experienced it as a method for befriending/pacifying my inner and outer enemies, I thought it could be useful to share my perspective. If something works better for you, please do that. much benefit can come out of any hermit or similar abstinence chosen person.